I have never caught a wild Massachusetts brookie. I've caught them in Maine and Vermont, but never in Mass. That's in part because there really are not many cold water streams left in eastern Mass. The water here is warmer than it tends to be out in the Berkshire's and what few cold water streams there once were have been damaged significantly by man's advancing urbanization. Yet another sad story of Man's destructive proclivities. But I wanted to catch a wild Mass brookie at some point and thus I decided that an online investigation was needed. 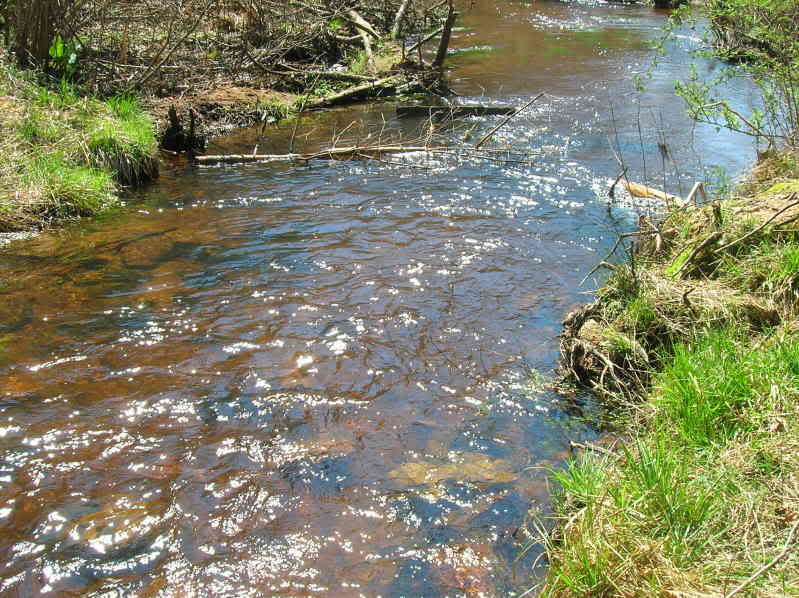 Much to my surprise, I read that there were creeks on Cape Cod that held brook trout that were not only native, but represented an even rarer variety; the salter, or sea run brookie. 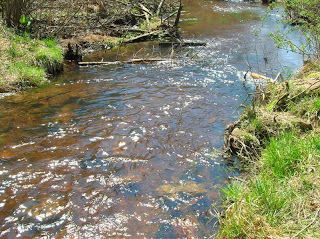 A stream no more then three feet across was touted as one of the last remaining stronghold's of native sea run brook trout in the US. And, located less than a mile from my parents cape house! I would need to investigate. On my way down to paint the boat yesterday I stopped at the stream. The water was clear and cold. I had about an hour to kill before I needed to meet my dad at the house so I decided to fish it. This stream was no place for a 9 foot 5 weight but a man goes to war with the army he has. After becoming mired down in mud and snagging a branch or two, I began to get the hang of the creek. It was tough fishing. Space was at a premium. In time however, I was able to get my streamer to swing past the fishy undercuts and fallen timber. But were there any fish to be found? I watched wave after wave of herring, thousands of them, move up the creek in schools. I watched crabs scuttle along the sandy bottom. I even spooked a large black eel at one point. The small creek was alive with creatures of the sea. I felt like I should have been casting a clouser minnow rather than a small gray ghost. Then, a strike. And an 11 inch salter was in hand. A beautiful gem from a tiny tidal stream. Then another bite, this one much smaller than the first, but no less beautiful. Gorgeous fish on a gorgeous morning. My allotted hour had expired, but now I have a new spot to play in that isn't far from home. I was wondering what you had going in the frying pan this AM! Solid work! well done sir! good recon. Salters for the Salty Dog. Time for a 7'6" 2wt maybe?? Good work Captain. Who would've thought the Cape to be a brookie destination.